Lounging in a moment of leisure, the Palo Alto High School custodians vie for space with the mountains of miscellaneous appliances that clutter the custodial office. Sunlight and laughter light up the garage-turned-office-turned-storage-space and its contents — mini fridges, vintage microwaves, power tools and random knick-knacks that cover almost every visible surface. The shriek of a walkie talkie jolts them from their idling and sends them bustling out the door and aboard their battered, Paly-green Textron E-Z-GO flatbed golf cart. We ask if we can catch a ride and they gesture for us to hop on before turning the keys in the ignition and taking off towards the Media Arts Center, where they’ve been called to set up for a staff meeting. We drive past throngs of students whose faces are painted with relief and fatigue as they begin their daily pilgrimage home. 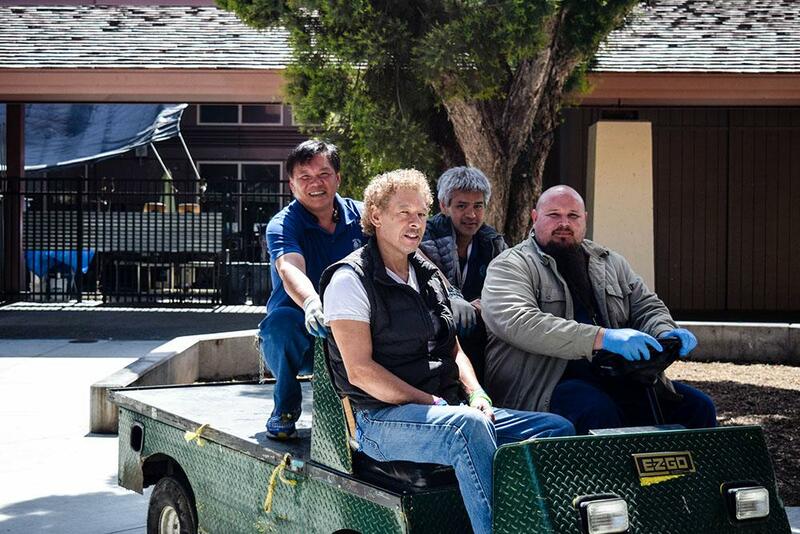 As their school day comes to an end, the work of Paly’s custodians is only beginning. Cuong Giang smiles wistfully after recounting memories of his life in Vietnam. Photo by Ashley Hitchings. It’s almost 6 p.m. on a Wednesday evening, hours after most students have already left campus, when we begin our escapade. Silence permeates throughout the campus in the absence of its chatty adolescent population. Only the occasional Rubbermaid carts, equipped with brooms, brushes, spray cans, dustpans and a yellow vinyl bag, give indication that anyone is nearby. It is as we meander past the English building that we notice one such contraption and meet Cuong Giang, the man operating it. Giang says he was born in South Vietnam and spent the first half of his life there, running a small business until the end of the Vietnam War. After the fighting had quelled, Giang and his family immigrated to the United States in 2001 to get away from the Communist government. He spent his next five years working at 99 Ranch Market, a Chinese supermarket chain with several locations in the Bay Area, before being introduced to his current job by a friend. Even though his job is taxing and requires heavy labor, Giang is still grateful to work where he works and do what he does. Like many immigrants who came to the U.S. in search of a better life, Giang sought, and says he has found, the American Dream. In his 60 plus years, Giang has experienced war, discrimination and moving to a foreign country halfway across the world, despite not having a full grip on the language. However, throughout our brief conversation with him, Giang doesn’t dwell on the negative for more than a moment. His sunny outlook shines through in his frequent smiles, animated gestures, and constant affirmations about how fortunate he is. Regina Buckner takes a brief break during a long day of work. Photo by Ashley Hitchings. The bell rings and we ride the wave of home-bound students before veering off at the junction between the robotics lab and the portables, heading towards the unassuming, usually-locked door that opens to reveal the custodial office. Regina Buckner is the only one there when we arrive. She’s among the first faces on campus in the morning and has been working at Paly for eight years. She’s also the only woman in the department. Raised in the Bay Area as a pastor’s daughter, Buckner says she grew up in church, splitting her time between Palo Alto and San Mateo, where her father preached at an Apostolic church. When her mother fell sick, she moved back to the Bay Area from Texas and eventually took on her current job. Though Buckner is a woman of few words, she gradually opens up, letting us in on her amiable humor and frequently breaking into warm, hearty laughter. She’s also a grandmother of four, though she doesn’t look it, with seldom a grey hair in her neatly slicked-back bun nor wrinkles behind her black cat-eye glasses. Whenever she has vacation time, she uses it to visit her grandchildren where they live in Stockton. A singer and a musician, Buckner’s penchant for music can be heard in the melodic lilt of her voice, every sentence lyrical and smooth. Formerly part of a family choir, music runs through her veins. Though her grandchildren are still young, ranging from a 1 year old to 8 years old, she hopes they will eventually develop the same love for music she possesses. Arvin Alumte lets out a bashful smile as he recounts his dreams for the future. Photo by Ashley Hitchings. As Paly custodian Arvin Alumete cleans and closes up the athletic center at the end of the day, Paly athletes seeking various physical needs pause to greet him as they enter and exit the tiny building. A custodian of three years at Paly, Alumete’s story began in the Philippines where he was born and spent the majority of his life. It wasn’t until 2012 that Alumete moved over to the United States when his parents petitioned him and his sister over to their new home. His journey over, however, would lead to personal sacrifices. “I was supposed to study, but I told to my sister that she can study first and that I can find a job,” Alumete says. In the meantime, Alumete is saving up for the future and to help pay for his mother to receive citizenship. As one of the youngest members of the custodial department, Alumete’s custodial job marks the beginning of his career. With his whole life ahead of him, Alumete is hopeful for the future and what it will bring. As he divulges his eventual aspirations, his eyes shine and he lets out bashful smile. Speaking from his personal experiences, Alumete strongly emphasizes the importance of education, especially given the tradeoffs he’s had to make and the difficulties he’s had to face. “Just focus on your studies and say thanks,” Alumete says.